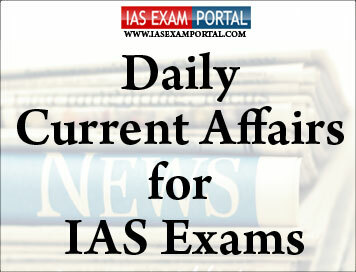 Current Affairs for IAS Exams - 31 JANUARY 2019 | IAS EXAM PORTAL - India's Largest Community for UPSC Exam Aspirants. Ahead of the LokSabha elections, the Election Commission of India (ECI) has rebuked Union Ministries for violating protocols while seeking approval for decisions to be announced after the Model Code of Conduct kicks in. Writing to the Chief Election Commissioner (CEC) or the Election Commissioners (EC) is not permitted, except in rare “important cases” where the head of a department feels that something has to be brought to the personal notice of the CEC or ECs. During general election to the State Legislative Assemblies of Gujarat and Himachal Pradesh, references from the Ministry of Civil Aviation and the Ministry of Human Resource Development, for grant of No Objection under the Model Code of Conduct were received in the form of an office memorandum,” Deputy Election Commissioner SandeepSaxena said in the letter sent to the Cabinet Secretary on December 18, 2018. The Commission decided not to consider the said references and returned them to the Ministries. Moreover, during the recent polls in five States, a Joint Secretary in the Environment, Forest and Climate Change Ministry made a reference directly to the Chief Election Commissioner of India “by name”, the Deputy EC pointed out. The financial statement of the Mahatma Gandhi National Rural Employment Guarantee Act (MGNREGA) scheme shows that as on January 30, 19 States and Union Territories were in the red, with liabilities ranging as high as Rs. 1,605 crore in Andhra Pradesh and Rs. 1,342 crore in West Bengal. Nationally, the scheme shows a negative net balance of Rs. 4,101 crore. The Rural Development Ministry received a supplementary additional allocation of Rs. 6,084 crore this week, as promised earlier this month. “On Monday, we approved disbursement to States based on their liabilities,” said a senior Ministry official, although this is yet to reflect on the financial statement. Having paid off liabilities, the scheme will now be left with less than Rs. 2,000 crore for the next two months. “The Ministry has requested another additional allocation of Rs. 5,000 crore,” said the official. Union Minister of Railways, Coal, Finance and Corporate Affairs ShriPiyushGoyal has congratulated the Department of Posts and India Post Payments Bank (IPPB) for their tremendous efforts in spreading the activities of the bank. Speaking at a special function organized to mark completion of two years of IPPB since its pilot launch, he said that by leveraging all 1.55 lakh Post offices across the country, IPPB would be able to provide banking services to the last man in the rural and remote areas and help realizing the dream of Prime Minister of economic transformation and creation of New India with all-encompassing financial inclusion. Launched on 01st September, 2018 by the Prime Minister of India across 650 districts, in a little over four months, the India Post Payments Bank (IPPB) has rolled out 1.25 lakhs access points across the country. Significantly approximate 1.10 lakh of these Access Points are located in the rural areas. Since its launch, IPPB has seen good adoption of its services. Over 30 lakh customers have opened savings accounts and are availing banking services like money transfer, bill payments, cash deposits and withdrawal at their doorstep. Further, almost 1 lakh Post Office Savings Account (POSA) holders have linked their old post office accounts with IPPB to enjoy interoperable banking services through channels like mobile banking, doorstep banking, SMS and IVR which were not available to them earlier. As a part of its strategy to promote a less cash economy and deepen the digital payments ecosystem, the IPPB has enabled digital payment through a simple QR code at more than 10000 Post Office Counters. Minister of Railways & Coal, ShriPiyushGoyal launched the report “The Future of Rail” of International Energy Agency (IEA) at an event here today. In his introductory remarks, Chairman, Railway Board, ShriVinod Kumar Yadav said that Railways can play an important role in the sustainable development of the world economy. He added that rail transport is superior to any other form of transport in terms of energy efficiency and being environment friendly. He highlighted the focus on capacity augmentation and infrastructural development by Indian Railways in recent years to make it an engine of growth for the nation. A blast of Arctic air from the polar vortex brought dangerous, bone-chilling cold to a wide swath of the United States on Tuesday, stretching from the Dakotas through Maine, with snow expected as far south as Alabama and Georgia. The Midwest was the hardest-hit region, as temperatures plunged below zero Fahrenheit (-18°C). By nightfall the mercury was hovering at 0°F in Chicago, 7°F (minus 14°C) in Detroit and minus 21°F (minus 29°C) in Minneapolis. Many Midwest cities opened warming shelters. Regional governments closed hundreds of schools and airlines canceled more than 2,000 flights, according to the Flightaware flight tracking website. Many had been destined for Atlanta, where the National Football League's Super Bowl will take place on Sunday. In Chicago, home to the nation's third-largest school system, officials plan to cancel classes for all 3,60,000 students on Wednesday due to the weather. Detroit also said all public schools would close, and Michigan State University said it would suspend classes, only the seventh time it has done so because of weather since 1855. There is an increased risk of communal violence around the elections in India if the BharatiyaJanata Party (BJP) stresses Hindu nationalism, Director of National Intelligence Dan Coats said in a statement titled ‘Worldwide Threat Assessment of the U.S. Intelligence Community’ on Tuesday. Mr. Coats testified along with CIA Director Gina Haspel, FBI Director Christopher Wray and other intelligence chiefs before the Senate’s Select Committee on Intelligence in connection with the intelligence community’s annual global risk assessment. Regarding India-Pakistan ties, the assessment was that “continued terrorist attacks and cross-border firing in Kashmir have hardened each country’s position and reduced their political will to seek rapprochement”. Opportunities for improving ties will be constrained as a result of “political manoeuvring” around the elections, the report said. The report also warned of tense ties between India and China. Chinese President Xi Jinping and Prime Minister Modi did not address border issues during their summit in 2018 (a reference to the Wuhan Summit), the report said, adding that “Misperceptions of military movements or construction might result in tensions escalating into armed conflict. The other assessments in the South Asia region include a stalemate in Afghanistan where neither the government forces nor the Taliban will gain an advantage in 2019 if coalition support levels remain the same, the report said. Cow urine, a minor fount of research in India for its medicinal benefits — may also contribute to global warming. The urine from the ruminant is a source of nitrous oxide emissions (N2O), a gas that is 300 times more powerful than carbon dioxide. In Women's Hockey, the final match of the 4-game series between India and World Cup bronze medallists Spain will be played at Murcia this evening. The match will start at 5:30 PM (Indian Standard Time). The series is currently square at 1-1. India had lost the tour opener, 2-3, before levelling the series with a 5-2 win in the third game. The second match had ended in a 1-1 draw.